Can I Use Retinol in the Summer? Yes, yes and please yes! One of the biggest myths in skin care is that you should stop using retinol in the summer because it will make your skin more “sensitive.” This is pretty much a telephone-game version of what happens. Retinol is vitamin A, and vitamin A is sensitive to sunlight, only in the sense that sun exposure will lessen the potency of the product. Can you see where it got lost in translation? The take-away is… use your retinol at night. That goes for summer or winter months. Retinol has been used for centuries to treat a number of skin conditions including acne, pigmentation (brown spots), enlarged pores and fine lines and wrinkles by normalizing cellular turnover, a process that slows down with age. A baby has a cellular turnover of about 14 days and in our 20’s we are still doing great at around 28 days. Our 30’s and 40’s take us up to 42 days, and, well, you get the idea. However, retinol’s greatest impact is on collagen, protecting and preventing collagen degradation due to sun exposure and age, and increasing new collagen production for smooth, healthy, younger looking skin. To this day, retinol has been recognized as one of the best anti-aging ingredients on the market, and it continues to stand up to its own standards. 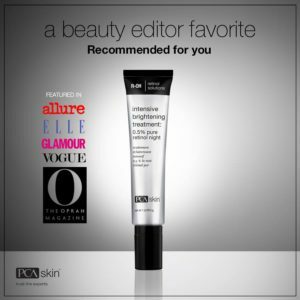 PCA Skin®, a leading skin care company in anti-aging treatments, has reinvented retinol utilizing a patented 10-hour time-release OmniSome® delivery system that stabilizes and carries a unique blend of ingredients deeper into the skin for superior results. And for the those that use retinol until summer hits…let me ask you this; you work very hard to treat your skin during fall, winter and spring, right? Why stop now? My last piece of advice, now that you’re using retinol year-round, is to be diligent about using a Broad Spectrum SPF 30 or higher on daily basis, rain or shine or snow. As long as you follow through, you can have your retinol and use it too.